Let’s get something straight: Central Valley people know full well we’re not exactly living in paradise. Most of our neighbors aren’t terribly well-educated. Decent-paying jobs are too few. It can be hard to find a good medical specialist when the need arises, and with our higher rates of asthma and obesity, the need arises too often. It’s awfully hot in the summer, our roads are bumpy, the air can be icky, and the tule fog in winter is downright murky. And our internet, well...when you. Log on. And try to. Find something. Sometimes. It takes. Forever. Yes, our homeless ranks are increasing, everywhere. Upward mobility is a dream for many. Some of our brightest kids go off to study, but few return. When reporters visit from Los Angeles or New York, invariably they work the adjective “dusty” into a description of our towns. Perhaps that’s a nod to our rich agricultural heritage; more likely, it’s because things can get dusty. Especially during the fall almond harvest. Maybe now is a good time to note that more almonds are grown here than anywhere else on earth. With walnuts, we’re just behind China. In fact, because of great soil, relatively plentiful water and a superb climate, our farmers can and do grow just about anything. Gallo, with headquarters in Modesto, produces more wine than any company in the world. So when people call us the Appalachia of the West, which they sometimes do, we take solace in knowing that few would trade the most productive fruit and nut basket on the planet for a dank coal mine. “We represent California’s next frontier,” said Mark Hendrickson, co-chair of the California Central Valley Economic Development Corporation. For starters, costs of living and of doing business in the Northern San Joaquin Valley are less than in Southern California or coastal areas. We’re just over the hill from the booming Silicon Valley and its high-tech magic. Ours is the quickest growing area in the state. UC Merced is its fastest growing campus, and we’ve also got high-performing University of the Pacific in Stockton and CSU Stanislaus in Turlock, with three junior colleges in the mix. “So things bode well for economic development,” said Hendrickson, who sang the Valley’s praises at a recent symposium in Toronto. How can we lure more business, and start turning around some of the things people don’t like about rural California? And that’s bad for farming. While the Valley’s agribusiness is second to none, farmers need signals for accurate field work. Export markets can’t function without reliable broadband. “We’ve got lousy internet throughout California, and it’s an essential piece of what we’re promoting in economic development,” McPeak said. “Everything depends on the internet.” Even in town, many customers have spotty internet if they’re further than 1,000 feet from fiber optic infrastructure. The speed of legislative solutions may resemble internet capacity in rural areas, but they are coming. Meanwhile, forward-thinking Valley leaders are pursuing public-private partnerships. Olsen, for example, envisions Modesto City Hall installing a fiber optic loop downtown, and her county board could provide a building to house Silicon Valley satellites recruited by the private sector. “We have a dream idea; we’re trying to figure out how to turn it into reality,” she said. It’s nice to think about more water storage, sure — it’s been several decades, after all, since California’s last major reservoir project. All the water talk in the Northern San Joaquin Valley these days, however, turns on the so-called state “water grab,” a proposal by state officials that would beef up the Stanislaus, Tuolumne and Merced rivers in the spring, leaving less for farms – and a few cities such as Modesto – during the growing season. The effort would benefit fish and the Sacramento-San Joaquin Delta, but many in the Northern San Joaquin Valley see it to also ship more water to thirsty customers down south. “It will be devastating to our rural communities,” said Michael Frantz, a board member with the Turlock Irrigation District, which feeds 150,000 acres of farms. If the state’s plan had been in place in 2015, the last year of a four-year drought, the Northern San Joaquin Valley might have lost 6,576 jobs, $167 million in farmgate profits, and with a multiplier effect, $1.6 billion in economic output. 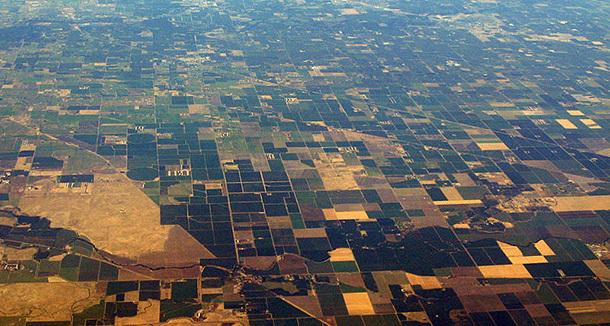 Farmers around Turlock and Modesto would have received no irrigation; row crop farmers can fallow ground here and there and still make it, but the nut orchards that abound in the valley and foothills would have been in peril, requiring massive well pumping and further endangering groundwater levels. New dams and near-stream storage, including underground holding ponds, will help. But Frantz’s water board is intrigued about Airborne Snow Observatory technology developed at the NASA Jet Propulsion Laboratory, which uses plane-mounted radar to map and measure the Sierra Nevada snowpack. The current decades-old method of estimating snow content with snowshoes and hollow aluminum tubes can be off by as much as 40 percent, while new ASO technology is remarkably spot-on. “It’s astounding,” Frantz said, because ASO enables water management like never before — providing virtual storage without the actual infrastructure. Expanding ASO beyond initial surveys of the Tuolumne, San Joaquin and Kings river basins would be expensive, so some water districts and scientists are trying to convince state legislators that an investment could bring huge returns. A plant in Keyes, a few miles south of Modesto, has been turning corn into conventional ethanol, to be mixed with vehicle fuel, since 2011. Its current owner, Cupertino-based Emetic Inc., is moving forward on plans for a similar plant in Riverbank, just northeast of Modesto, except this one would convert old almond, walnut and pistachio trees into cellulosic ethanol, a similar fuel additive. In olden times, farmers would tear out orchards and burn the waste, spewing air-borne toxins to be trapped in the bowl-shaped Valley atmosphere. Wood-burning co-generation plants were an improvement, but also fell out of favor as air-quality rules became increasingly stringent. A wood ethanol plant could make something useful of the Valley’s 1.6 million tons of tree waste generated each year, and similar technology could be applied to help rid the Sierra Nevada of the millions of pine trees that succumbed to drought and beetle infestation in recent years. Ultimately, leaders must stay strong in defense of the Valley. Garth Stapley writes for the Modesto Bee.